Chop and pound in a mortar 10 oz of lean veal or pass it through a mincing machine, then chop up an equal portion of oysters, add a tea cupful of fine bread crumbs 4 oz of beef marrow also chopped a tablespoonful of finely minced parsley season with a dust of grated nutmeg , a pinch of powdered [male?] pepper and salt to taste. Moisten the whole with the well strained liquor of the oysters and one tablespoonful of sauce, bind them with a well beaten egg. Dust the hands with flour and form the mixture into sausages, fry till of a light-pale brown in some clarified lard or good dripping. Lay them on some buttered toast dust with coralline pepper. squeeze on them the juice of a lemon. Serve on ornamental papers. garnish with tufts of parsley. 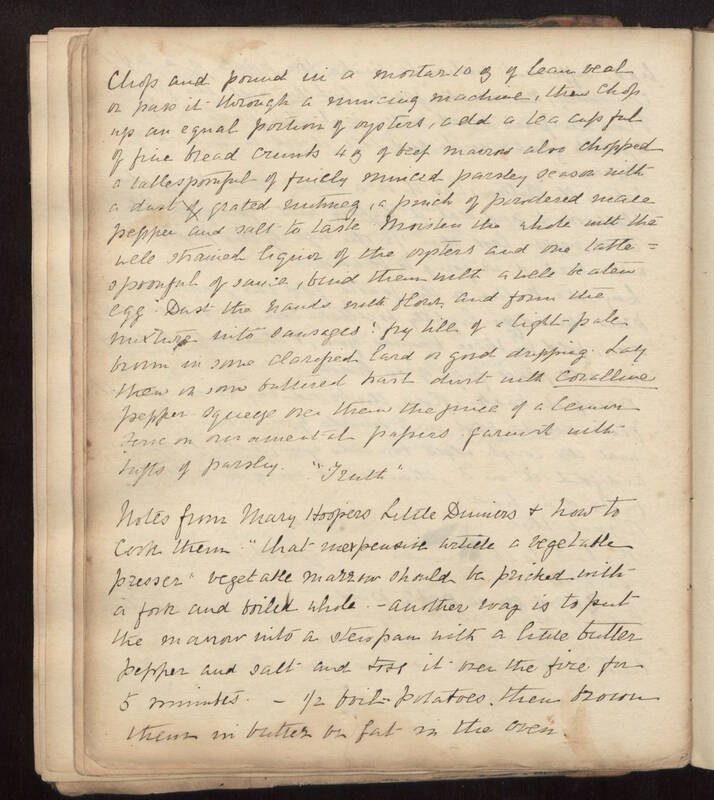 "Truth" Notes from Mary Hoopers Little Dinners & how to cook them. "that inexpensive article a vegetable presser" vegetable marrow should be pricked with a fork and boiled whole - another way is to put the marrow into a stewpan with a little butter pepper and salt and toss it over the fire for 5 minutes - 1/2 boil potatoes then brown them in butter or fat in the oven.